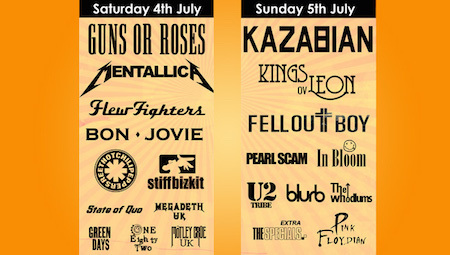 UK TRIBUTE Festivals, the team behind free rock festival, Festwich, are bringing their new music festival to Moor Park in Preston on July 4 and July 5. Meeting by WHSmith inside Manchester Piccadilly train station. Or if you would prefer to meet us there, the venue is at: Moor Park, Preston, Lancashire, PR1 6AS. Festival curator, Jools Taylor, explained: “We’ve been in close discussions with Preston City Council and are extremely excited to be bringing a new festival to Preston in summer 2015. “Our festivals are unique as they are free to attend. The ticket is free and all people pay is the booking fee. Festwich has seen some of the best tribute acts from around the UK and Europe including tributes to Arctic Monkeys, Red Hot Chilli Peppers, Muse, Metallica and many more. It will return to St Mary’s Park in Prestwich in summer 2015. In Preston, the organisers are promising two full days of live music, with over 30 acts, including well-known tributes acts as well as up and coming talent. We will be catching the 10:16 train. The cost of a dat return ticket at time of writing is £11.90.